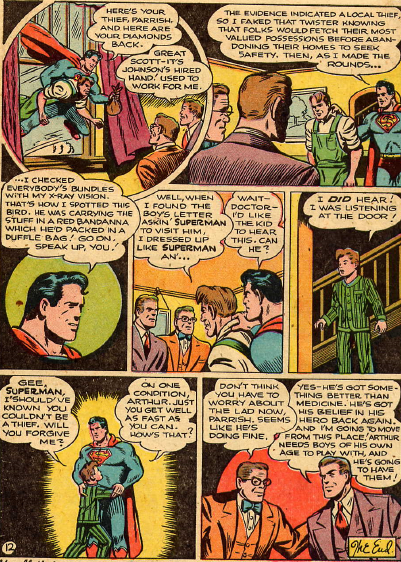 Ira Yarborough is the artist on the Superman story in Action 115 (Dec. 47). 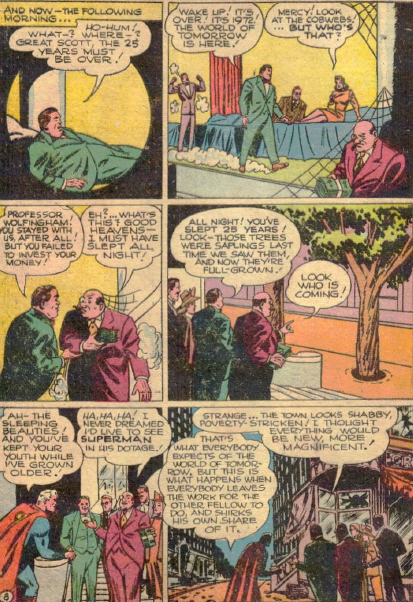 The story opens with a rich but lonely boy who writes a letter to Superman. 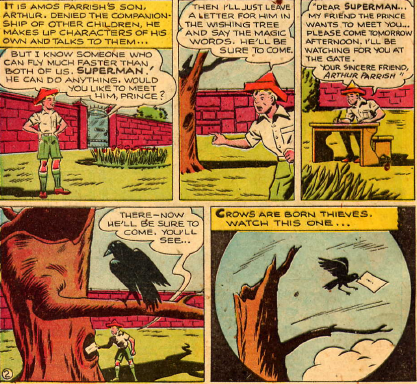 The letter is grabbed by a crow, which promptly get shot by a farmer, who intercepts the letter. The farmer then does a really lame job impersonating Superman, but it’s good enough for the boy, who lets himinto the house. 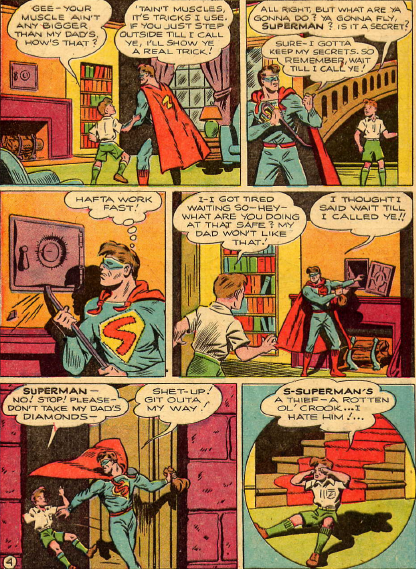 The phony Superman steals diamonds from the safe, and takes off, leaving the boy devastated at his hero’s betrayal. 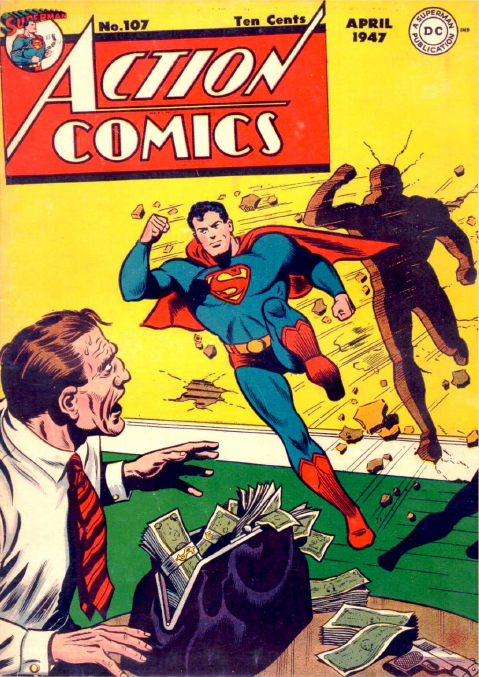 The news of Superman’s apparent theft reaches the Daily Planet, which gets the real Superman on the case. The boy has fallen ill, and is being treated by a doctor who seems to have little faith in his own profession, insisting that the best cure is solving the crime. And it turns out the doctor was right. 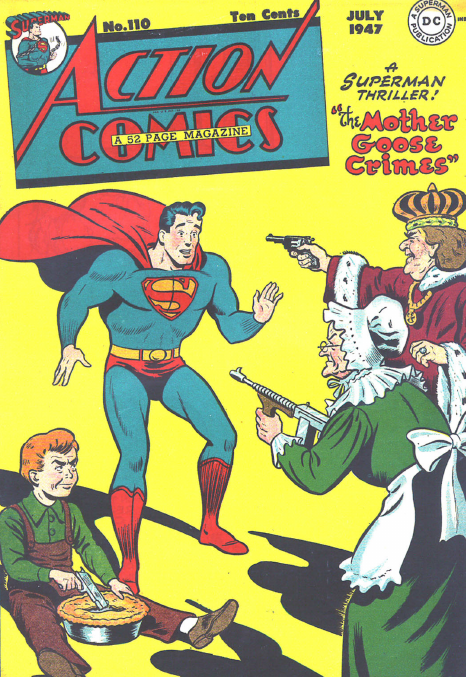 Superman finds the farmer, retrieves the diamonds, and gets the man to confess to his impersonation. 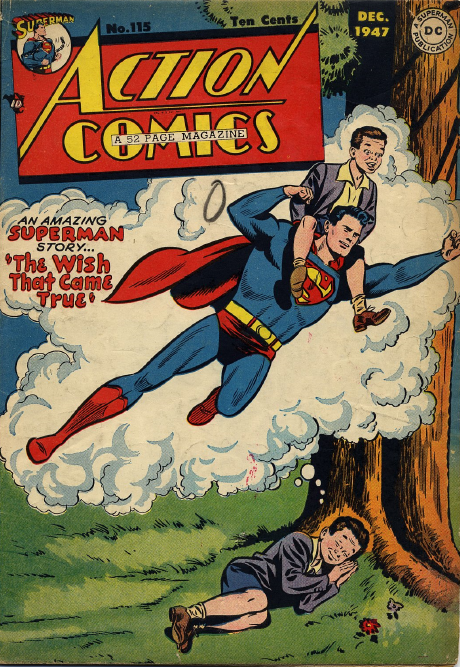 The boy is cured, as his faith in Superman is restored. George Roussos really goes to town on the Vigilante story in this issue, which clips along at a rapid pace, with excellent visuals. It’s more crimes by the Rainbow Man, using his colour wheel. 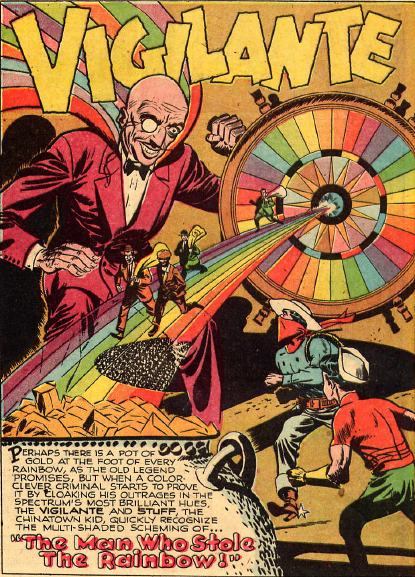 Unlike the last story that featured that wheel, which seemed to imply that the crimes were only conceived after the colour was chosen, this one makes it clear that the Rainbow Man has a number of plans ready to go, and just uses the wheel to pick the next one. 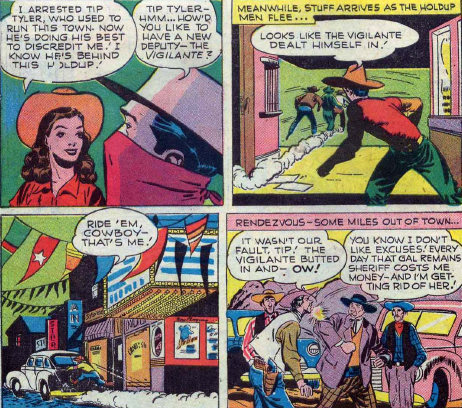 He pulls off quite a few robberies during the course of the story, with Vigilante and Stuff constantly on his trail. They succeed at capturing him at the end, spray painting him and his men green to aid in their identification. 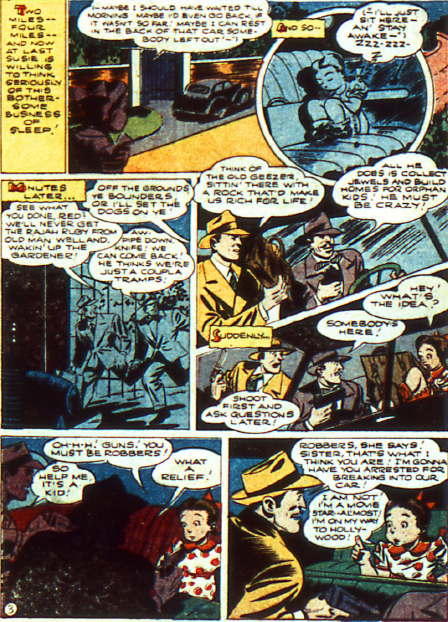 Susie returns in the Ira Yarborough tale in Action 110 (July 1947), although the story does not have her usual theme of telling lies. 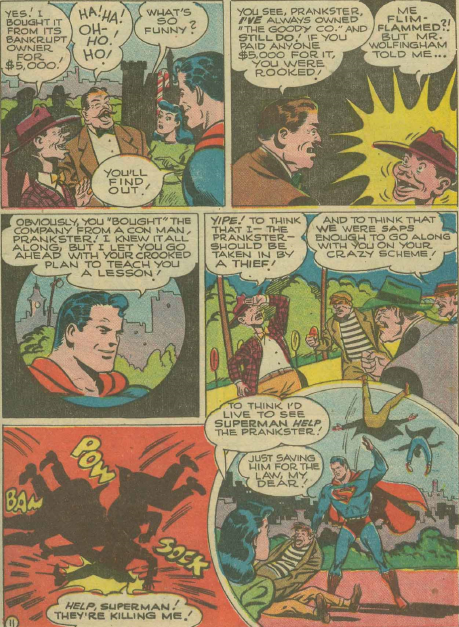 Lois tricks Clark into accompanying her and Susie to a Mother Goose show for children. Susie gets bored and wanders off, and you can’t really blame her, the show looks awful. Hoods are trying to rob the show, dressed in costume. 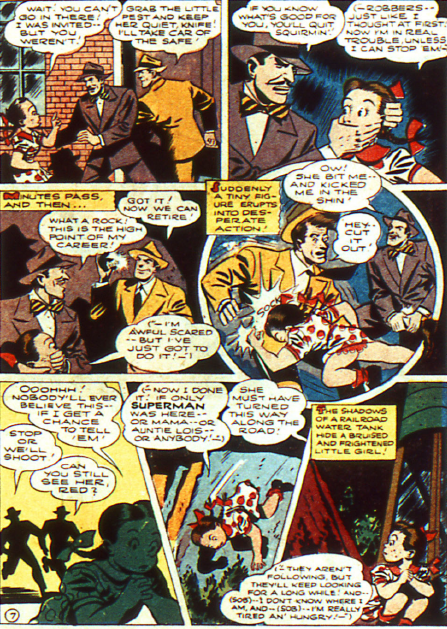 Between Superman’s efforts to stop them, and the fact that the audience thinks the robbery is just part of the show, they fail dismally. 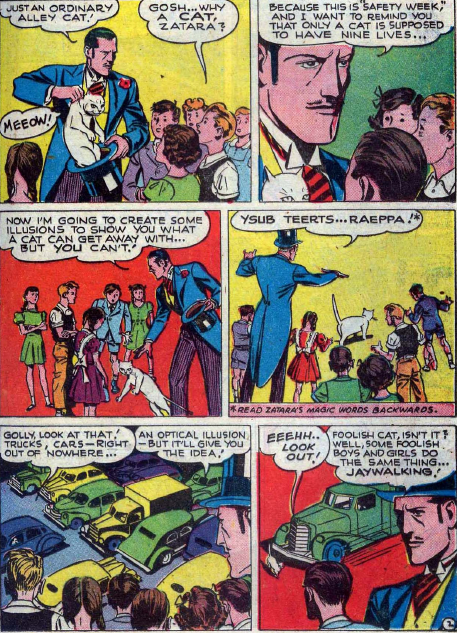 One of the reasons I am including so few Zatara stories is that they have gone from being silly and jokey to preachy. This story by Samachson and White is a perfect example. 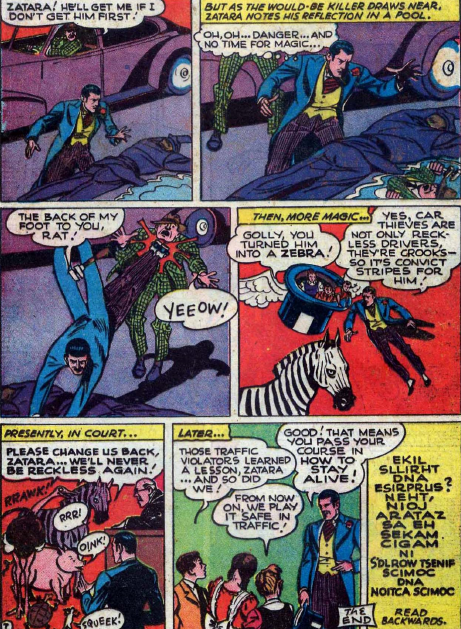 Zatara is performing for a group of school children, and all his magic is dedicated to traffic safety. As a kid I really hated any story that worked so obviously to push its message, and the magic just isn’t dramatic enough to carry it above the spoon-fed authority. 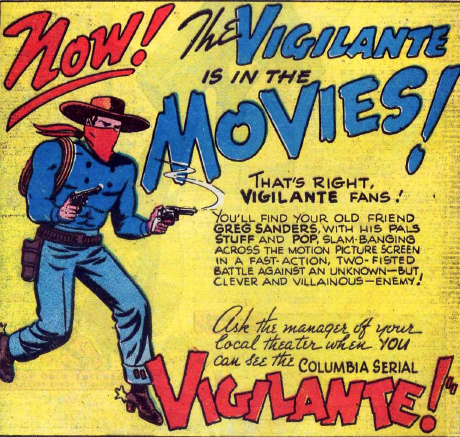 The Vigilante and Stuff are in the west again, at Benton City’s centennial, in this story by George Roussos. The town elected the great-granddaughter of the founder as sheriff for the centennial year, but she is having a difficult time maintaining her status, as the criminals are trying to discredit her. 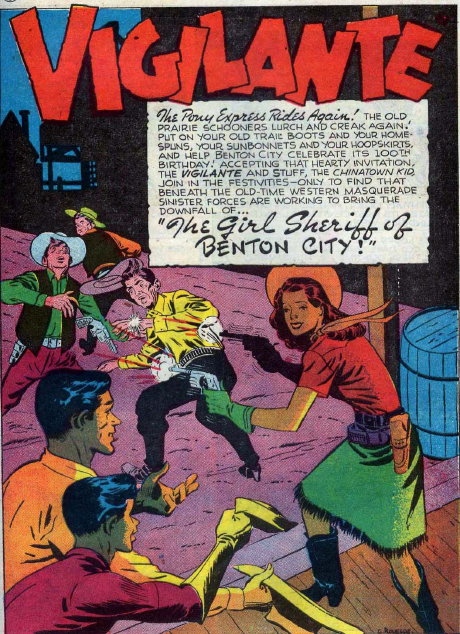 Although it is clearly unusual to have a female sheriff, she is shown to be fully capable of her duties. Vigilante helps her out, but this is obviously meant to be a special case. 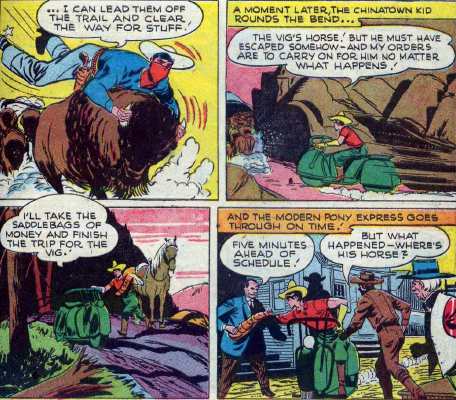 Stuff is looking a little less Chinese now, although he is still called the Chinatown Kid. His odd hat, which was clearly meant to convey some sort of Chinese headgear, is nowhere in sight. 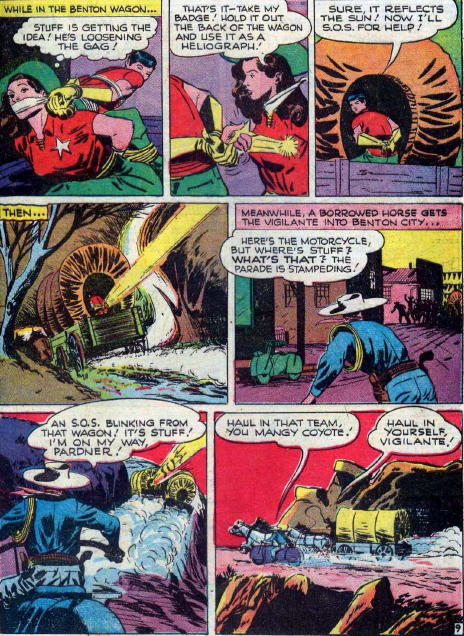 The Vigilante’s cycle has almost reached its classic state, although it’s a horrible green in this story. The most awkward moment in the story comes when Stuff has to pull the badge off the sheriff’s ample chest, to use to cut them free. 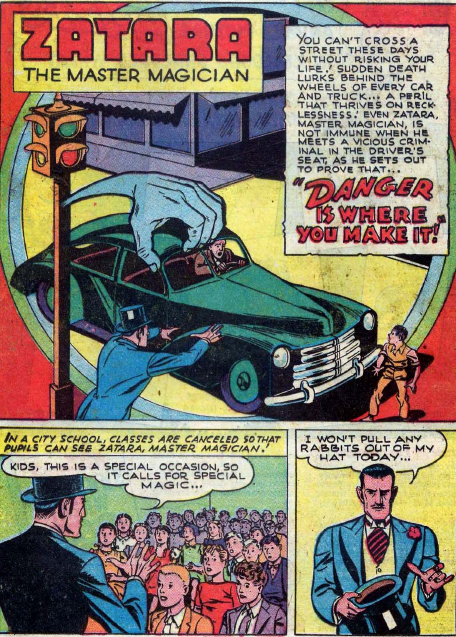 The Vigilante serial was advertised in this issue. Greg Sanders is made an actor, rather than a singer, and Stuff is made into a young, white adult. The actor idea would not take hold on the comics, but Stuff’s race change would. 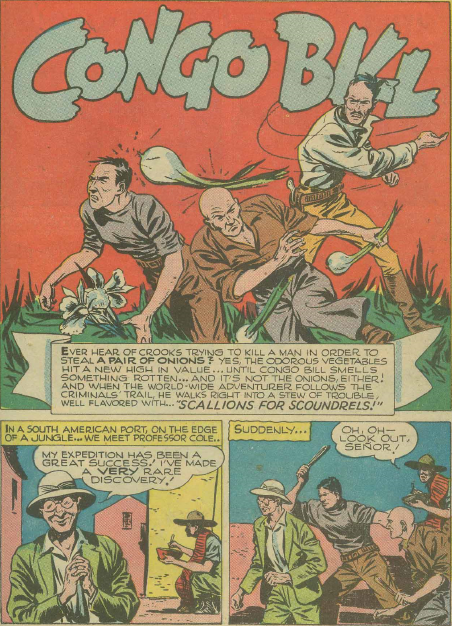 Don Cameron and Ira Yarborough work on the Superman story in Action 107 (April 1947), which doesn’t really have anything to do with the cover. The story centres on con man J Wilbur Wolfingham, who opens the story by catching a cat. 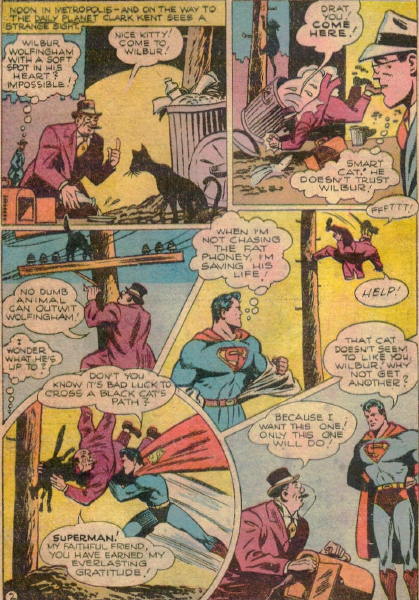 For a con man, he is remarkably unaware of his surroundings, as he is being watched by Clark Kent, who turns into Superman to rescue him, and Wolfingham noticed nothing. Wolfingham is using the cat in a scam to put people into suspended animation, while their money accumulates over the years, so they will wake up rich. 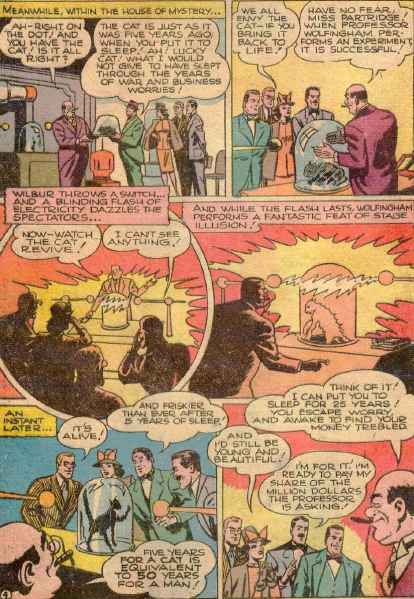 His system is a fake, but Superman makes Wolfingham think it actually works, and pulls a huge con on him. 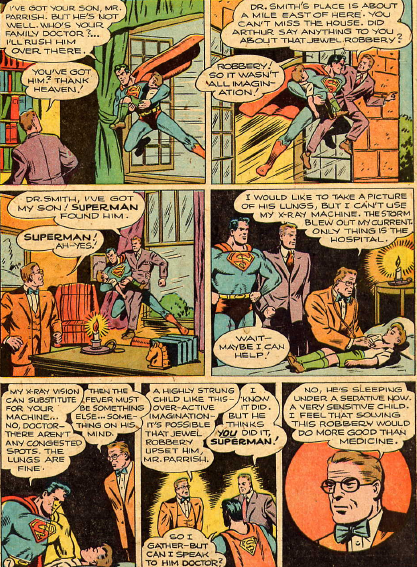 With dozens of people helping him, Superman convinces Wolfingham that he has been awakened from suspended animation in 1972. So many people did this, that no one kept working, nothing new was produced, and their vast riches are valueless. 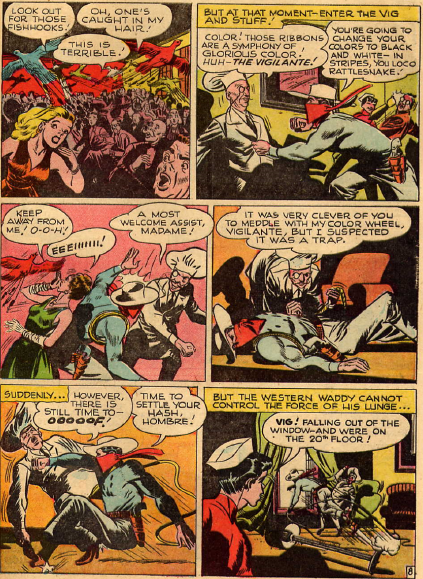 Of course, once Superman’s con is revealed, there is no reason for Wolfingham to change his tactics, but he is apparently so traumatized by the experience that he does. 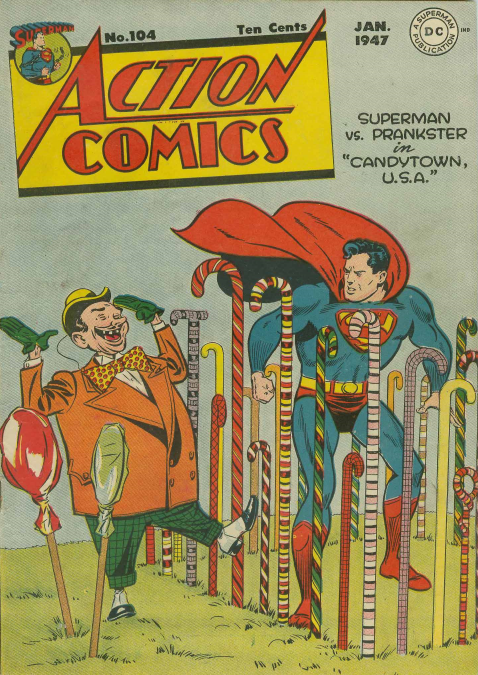 Jerry Siegel and Ira Yarborough give the Prankster the cover of Action 104 (Jan. 47), for his latest tricky gambit. The Prankster convinces a confectioner to create an entire town built of candy, as a way of luring children and promoting their products. It’s so devious, it must be legal. 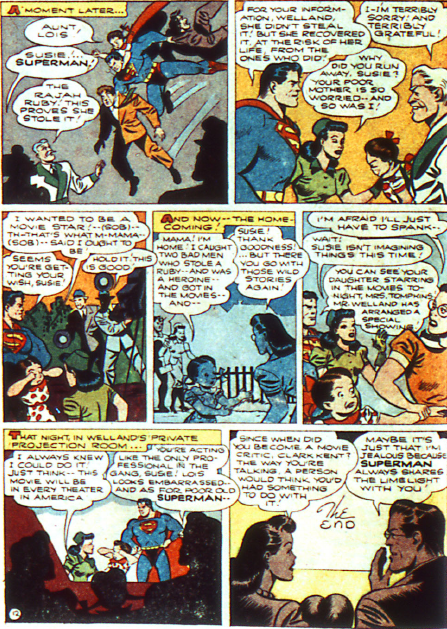 Superman and Lois Lane are just chomping at the bit, trying to catch the Prankster at something. 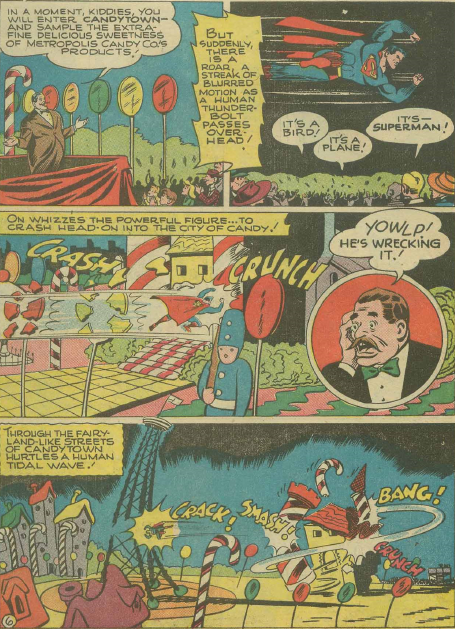 The Candy Town opens, but Superman immediately demolishes it. The Prankster has a bus handy, and takes the patrons to his rival candy town, which he has just opened. The Prankster had “spiked” the candy of the real town, making it taste awful. 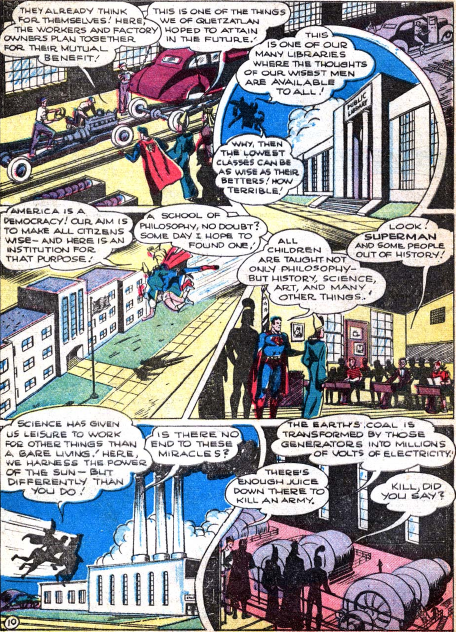 Superman rebuilds the town, without the awful flavours. In a really nice touch, the Prankster discovers that he does not actually own the rival town, the confectioner does. The Prankster refers to buying the company from a man named Wolfingham, obviously a reference to J. Wilbur Wolfingham. Samachson and Smalle return Congo Bill to Africa, in a curious tale that sees men attack someone in order to steal what appear to be onions. Bill follows their trail, and winds up in a lush jungle of rare and exotic plants, and realizes that the “onions” were actually bulbs of these expensive flora. The art really makes the most of the jungle setting. 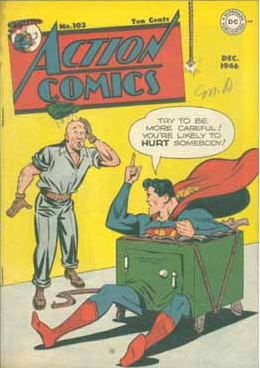 Action Comics continues to attempt to evoke laughter with its Superman cover on issue 103 (Dec. 46). Myabe it worked on you, it didn’t on me. The story in the issue is pretty good, though. 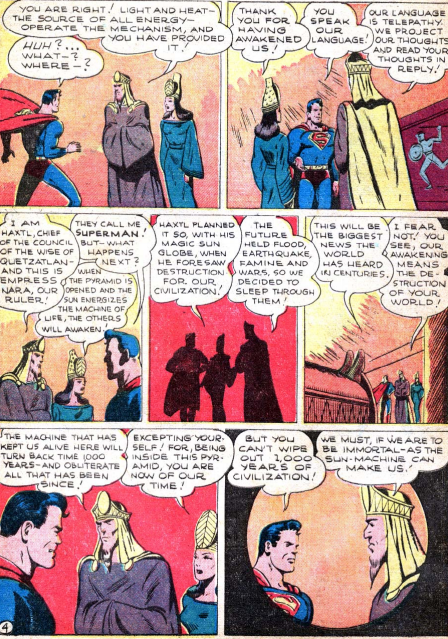 Ira Yarborough does the art, as Lois and Clark accompany an expedition in Central America. They find the entrance to a buried city, and light restores the inhabitants to an active state. This follows many such stories, with the ancients having knowledge far greater than that of the modern world. In their eyes, spreading their culture, and eradicating the current one, is all for the greater good. 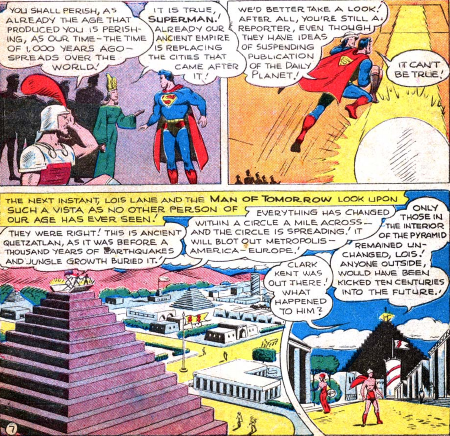 Superman sees the city begin to spread out through the jungle, and uses it as an excuse to explain where Clark Kent went. 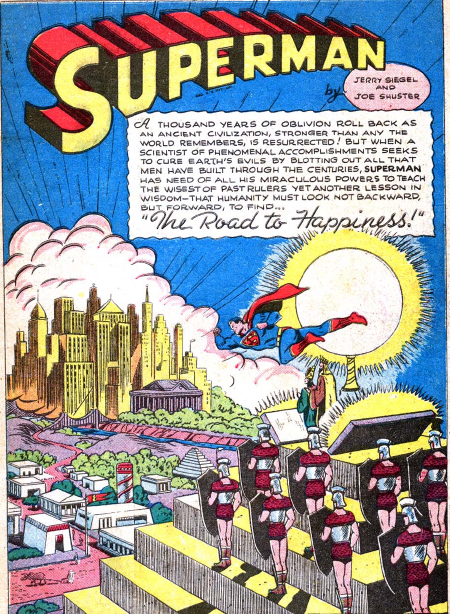 In an interesting twist, rather than battling the ancients, he takes them on a tour of Metropolis, showing them the wonders of the “present,” which is some cases exceed anything the ancients had managed to achieve. He wins over most of them, though there is a climactic fight with one who still wants to destroy the outside world. This battle winds up demolishing the machine the ancients used to spread their world. The story leaves them in Central America, no longer immortal, and unable to reconstruct their society. So I guess Superman just sort of left them to be eaten by wild animals. 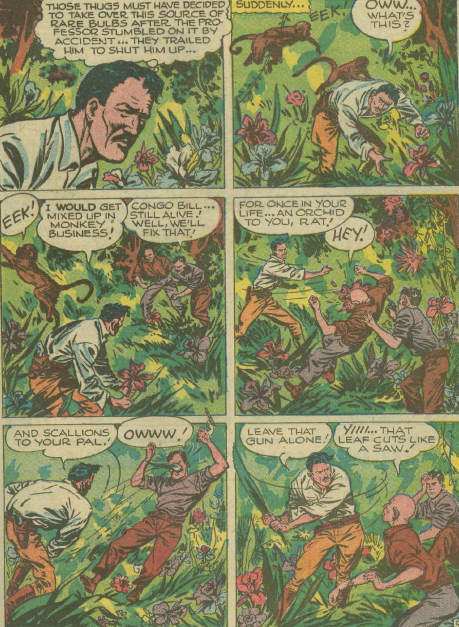 The Rainbow Man escapes prison again, and Vigilante is hot on his tail in this story by Roussos. For some reason, the Rainbow Man spins a colour wheel to determine the theme for his next crime, rather than planning it out in advance. Perhaps that why this spree does not work very well. He pulls off a gold themed crime, attending a fund raiser disguised as an artist. Greg Sanders is also performing at the benefit, and has learned to pay attention to those he shares the stage with. He spots Rainbow Man, who can tell that he has been recognized. For some reason, Rainbow Man does not put two and two together, and figure out that Greg is the Vigilante. 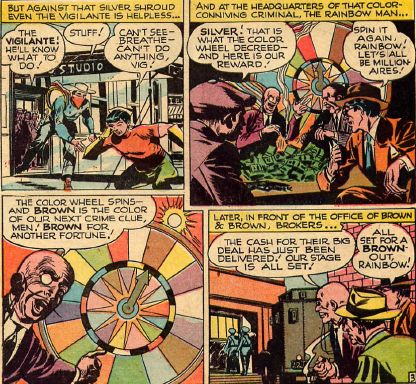 The Rainbow Man eludes Stuff and the Vigilante, and spins his wheel again. His red crimes do not succeed, though, and he gets captured. But will return! 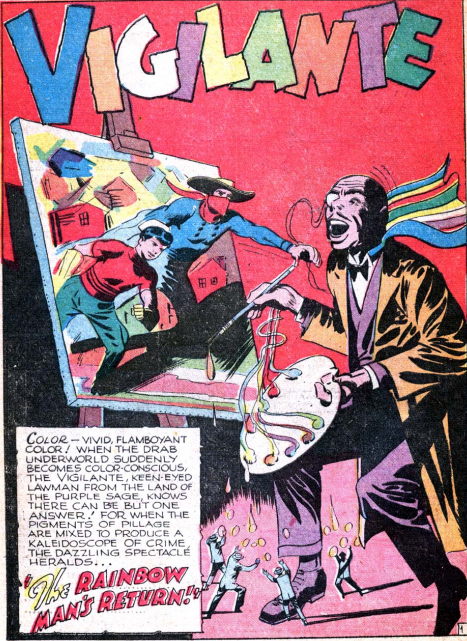 It’s odd that Rainbow Man, who has faded into obscurity, outlasted the Dummy, and made more appearances in the Golden Age than that villain. 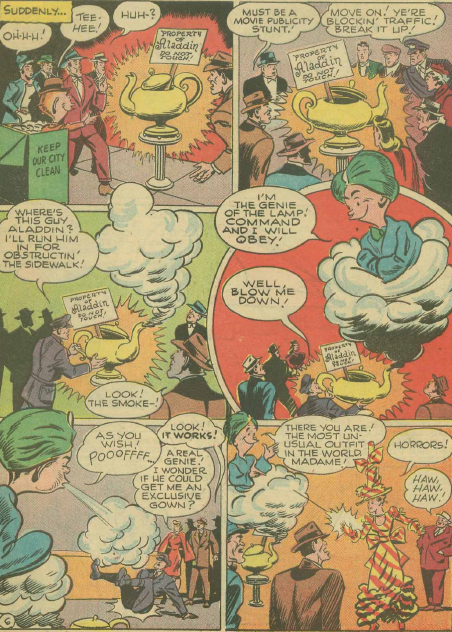 Don Cameron, Ira Yarborough and Stan Kaye bring Mr. Mxyztplk back in Action 102 (Nov. 46), as the imp learns about the legend of Aladdin’s lamp, and decides to create one himself. 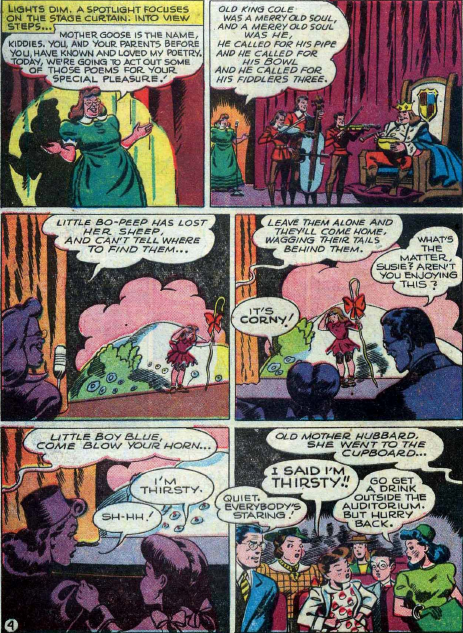 Mr. Mxyztplk gives people their wishes, but in his fashion. 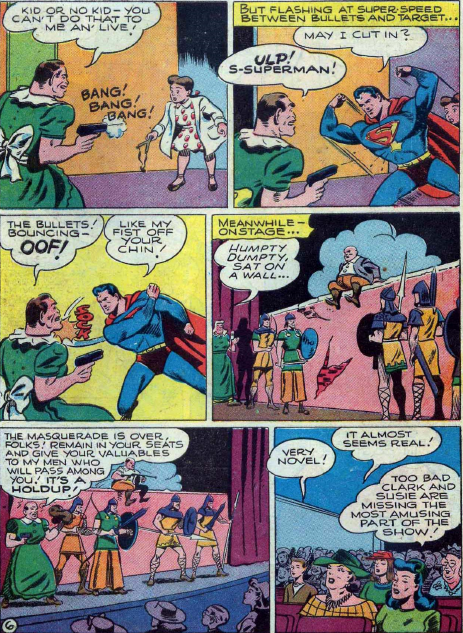 When people discover their wishes have become nightmares, they beg for things to return to normal, but Mxyztplk refuses. 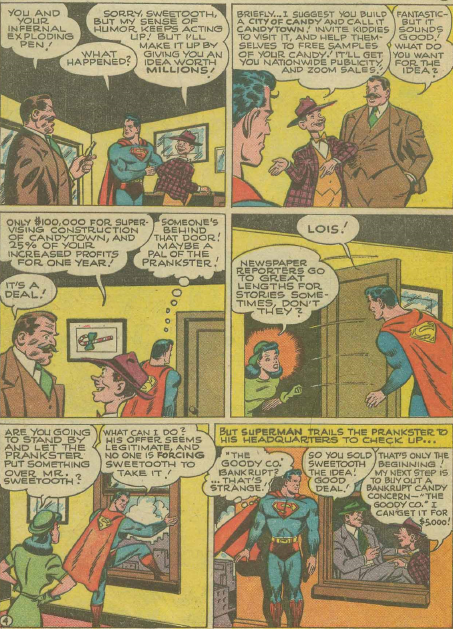 It’s Lois Lane who outwits the imp, rather than Superman. 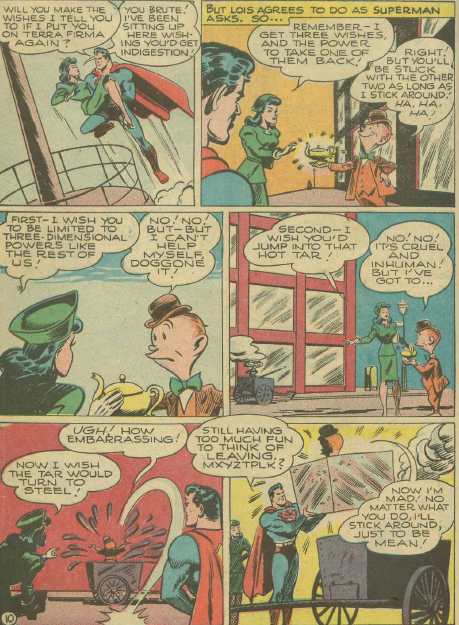 She asks for three wishes, and then uses them to remove Mxyztplk’s powers, and have him encased in steel. With no way to escape, the imp has little choice but to say his name backwards, and return to the 5th Dimension. 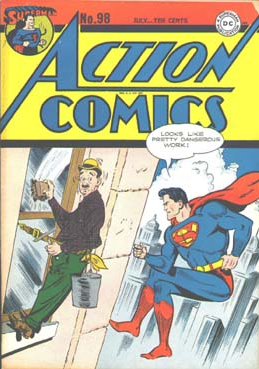 A slapstick-y cover for Action 98 (July 1946), and an equally light Superman story inside this month. 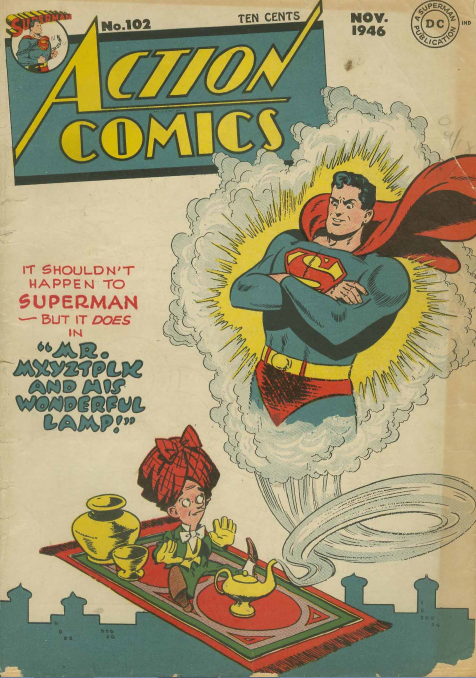 Ira Yarborough brings back Lois Lane’s niece, Susie, for another romp of lies that Superman makes comes true. Completely unlike the Hocus and Pocus stories, in which he makes fake magic come true. Susie starts off the story by insisting that she is about to become a movie start. Her mother, Lois’ unnamed sister, gets upset with her for lying, and Susie runs away. She goes to sleep in what seems to be an abandoned car, but it actually belongs to some thieves. 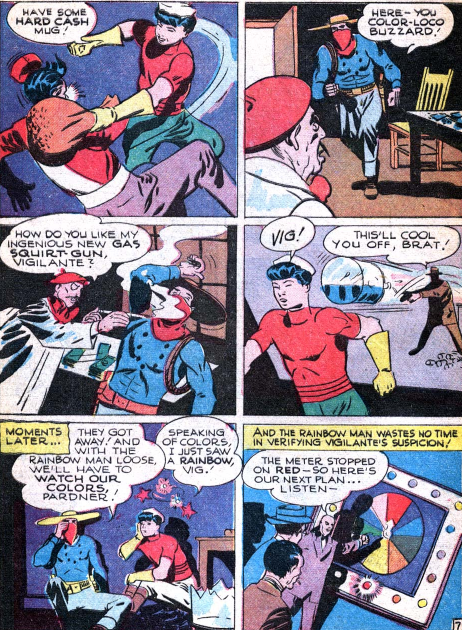 While Lois and Clark starts searching for the runaway girl, the hoods use Susie to gain access to a home, in order to rob a ruby of the owner. Susie realizes she is helping thieves, and runs away from them as well. It’s a lot of chaos and silly comedy, which of course ends with Susie actually being in a movie. 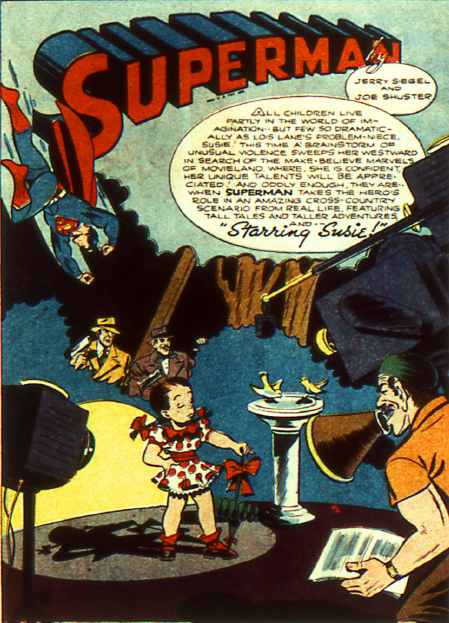 It’s somewhat ironic that all of Susie’s “lies” eventually come true, with Superman’s help. Is Susie really lying, or does she have some sort of psychic power she is too young to understand?